Startups are pioneering the use of blockchain technology, and they are quickly starting to gain mainstream attention. These startups are not only changing the way we track, store and send information, but are also creating a brand-new way for smaller businesses to raise capital. This new model of funding is called an initial coin offering, or ICO. This model can also be referred to as a “crowdsale” or “token sale.” ICOs function as a hybrid model of stock IPOs and crowdfunding pre-sales that greatly reduce the barriers to entry for both investors and businesses alike (similar to Kickstarter). Instead of a stock, these innovations offer cryptocurrency-based tokens to the public, specific to their own initiative. These tokens can serve a myriad of purposes that vary depending on the platform they are created for. In exchange for tokens, businesses generally receive either bitcoin (BTC) or ether (ETH) and use the raised funds to pay out their team and cover future expenses. This new model of funding has been a smashing success thus far, most recently with Aragon, a platform for creating autonomous businesses, raising $25 million in less than 15 minutes, and Brave’s Basic Attention Token (BAT), which met its crowdfunding goal of $35 million in 24 seconds. How Are ICOs Being Regulated? Are ICOs a Legal Funding Model? ICOs are in a legal gray area. Most tokens are not quite securities, not quite currencies, and many claim not to be of an investment nature at all. Tokens and cryptocurrencies don’t fit any traditional asset class. As you might expect, this fosters a great deal of uncertainty. So new are these ICOs that no judge in the U.S. has had the opportunity to officially apply existing securities laws to these technologies. In the U.S., the process for determining whether a transaction is considered a security is called the Howey Test. The first ruling by a U.S. judge on this test as it applies to digital currencies and tokens will have many implications, most notably whether token issuers are required to comply with the strict requirements of the Securities Act of 1933 and the Securities Exchange Act of 1934. The lack of regulatory clarity surrounding ICOs, particularly in the U.S., is unsettling to many and has forced innovators in this space, like Blockchain Capital, to blacklist unaccredited U.S. investors and launch their crowdfunds from places like Switzerland or Singapore, where governments have already ruled that digital currencies are not securities. 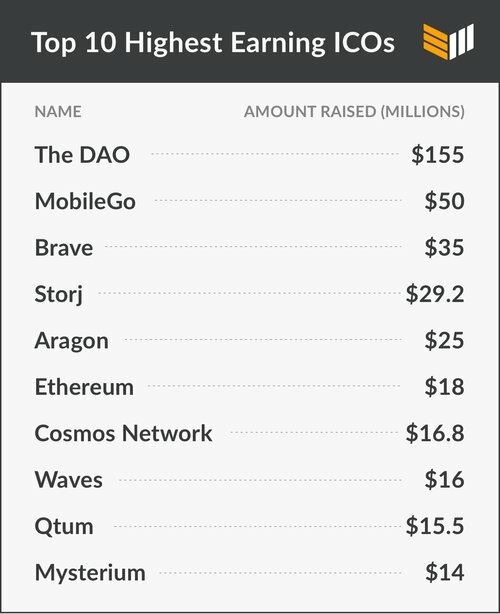 Note: 7 of the 10 initiatives in this list come from ICOs held in the past three months. Dollar values are based on BTC and ETH evaluations at the time of the ICO. The democratic access to investment that ICOs foster is reflected also in the variety of projects that people choose to fund and participate in. Here are some of the projects that have been supported in the past, as well as a few that are coming up in the near future. Perhaps the best-known ICO, although at the time it was just considered a crowdsale event, is Ethereum, which raised over $18 million (at the time) in late 2014. The Ethereum blockchain is a distributed smart-contract platform fueled by a native digital currency called ether. Ethereum’s ICO was monumental for a couple of reasons. It was one of the first successful ICOs in the space and laid the groundwork for how many of them have worked since. It also created the Ethereum blockchain platform, upon which many of the following decentralized applications (DApps) and projects are being built. In November of 2016 Golem launched an ICO that they denoted as a “crowdfunding campaign” and raised 820,000 ETH. At the time of the ICO, 820,000 ETH was equivalent to ~$8,600,000. Today that ETH is worth ~$165,000,000. In exchange for 1 ETH, investors received 1000 Golem Network Tokens, or GNT. The token itself will be used as the medium of exchange for computing power on the network. According to CoinMarketCap, the total valuation of GNT in circulation today is ~$350,000,000. Qtum (pronounced Quantum) is a Turing-complete blockchain stack with smart-contract capability. Their biggest innovation is the implementation of a proof-of-stake protocol, as opposed to the energy-intensive proof-of-work protocol employed by the Bitcoin and Ethereum blockchains. Qtum has only released a testnet thus far, but they concluded their crowdsale on March 21. The crowdsale raised over $15 million in five days. Early-bird investors received 115 QTUM in exchange for 1 ETH. That funding will be used to finish the development of the mainnet and other future upgrades. The DAO was the most successful crowdsale of all time, although the author of the white paper and lead developer of the smart contracts, Christoph Jentzsch, doesn’t describe it as an ICO. “The DAO was not an ICO. It was the creation of a decentralized autonomous organization, similar to a company,” he told Bitcoin Magazine in a recent interview. “There was no seller; the contributors stayed in control of their funds. It was comparable to a large joined (bank) account.” In other words, The DAO basically sold ownership of itself to the masses, and simply raised ether by doing so. That ether, in turn, would have been used to fund future projects that DAO token holders deemed investment-worthy. The vision behind The DAO project, though ultimately derailed by a smart contract vulnerability, was to create an autonomous corporation. People who purchased DAO tokens would get to vote on how The DAO would allocate resources and what projects and contracts it would take on or fund. As Jentzsch puts it, “People send ETH to the contract and received DAO tokens, which gave them voting power about what to do with the ETH.” Ideally those token-holding investors would then have gotten a portion of the profits, a dividend, from The DAO’s successful ventures. Through that grassroots effort, The DAO managed to raise 12.07 million ether (ETH) in the early summer of 2016, making up 14 percent of all ETH issued to date. This equated to $155,000,000 at the time of the crowdsale. Being such a successful token sale and raising so much publicity came with one major drawback: it put a target on The DAO’s back. Hackers knew that if there was a way to exploit this system, a “bug” per se, ultimately the payoff could be lucrative. Unfortunately a bug was discovered, and a hacker was the first to discover it, which led to approximately 3.5 million ether getting siphoned out of the system. The majority of the money was repaid to investors by means of the infamous Ethereum Hard Fork, which led to the creation of Ethereum Classic. An innovator in the field of venture capitalism, Blockchain Capital (BCAP) is looking to help fund the next great initiatives in the digital arena. Brock Pierce, managing partner at Blockchain Capital, describes the goal as “providing the investor base across the globe with the opportunity to invest into a leading venture fund via a liquid, tradable, digital token.” The token represents a fractional, indirect and non-voting economic interest in BCAP’s First Digital Liquid Venture Fund. The portfolio that BCAP maintains is impressive. With current investments in big names like Coinbase, Bitfury, Ripple and ShapeShift, BCAP stands to be an accelerating force for innovation in the infrastructure of blockchain technology. BCAP’s token sale met its $10 million target cap in six hours in April 2017. Digix DAO was Ethereum’s first major decentralized autonomous organization and first on-chain crowdsale. Digix uses two tokens to operate, DGX and DGD, but only DGD was offered in an ICO. A DGX token is an on-chain proof of ownership of 1 gram of 99.99 percent LBMA-standard gold that is secured by Digix. DGD entitles its owner to quarterly rewards from DGX transaction fees. The Etherscan of the DGD crowdsale indicates they raised 465,135 ETH at a valuation of $5.5 million. Today that ETH is valued at over $100 million. Augur, which launched its token sale in July of 2015, functions as a decentralized platform for prediction markets. By decentralizing the markets, it allows the average person to gain access to them. This therefore creates a more accurate predictive engine due to the wider swath of people participating and investing in their predictions. What makes Augur especially innovative is that it also allows the average person to make his or her own prediction market, centered around an event or idea of their choosing. An important distinction to make is that Augur itself is not a prediction market. Rather, it is an open-source code atop which markets can be built. The Augur token sale used a “live-action” sales model, in which the distribution of their token was adjusted in real-time. The amount of tokens an investor ultimately ended up with was determined by the percentage their investment made up of the total crowdsale and how early they participated. As a part of their token sale, Augur sold Reputation Tokens, or REP. REP is not required to make predictions on Augur’s market. Instead, owners of REP are expected to report on the outcomes of events within Augur every few weeks. Those who report inaccurate outcomes will forfeit some REP, and their forfeited REP will be distributed among those who reported accurate outcomes. Gnosis is a platform for creating prediction markets and is a direct competitor of Augur. However, Gnosis’s ICO and business model do have significant differences. The Gnosis ICO pricing was determined using a decreasing-cost auction mechanism, or “Dutch auction.” In a Dutch auction, purchasers indicate a maximum price they are willing to pay for GNO tokens, but everyone ultimately pays the same final price that is either lower or equivalent to their maximum price. Unlike REP from Augur, GNO tokens serve no purpose on the Gnosis platform. Instead, ownership of GNO serves as an IOU for WIZ, or wisdom tokens, which can be used to pay fees on the Gnosis platform. According to the Gnosis white paper, WIZ tokens will also function as the payment medium for GnosisPremium, a platform that will be actively supported by developers and allow for stable coins, customization tools and other premium features. Gnosis will also offer a free platform, GnosisBasic, that will not be actively supported by developers and will have a less robust user interface. Kik recently entered the digital asset arena with the announcement of their own token, Kin. This announcement may signal the transition of digital asset tokens into mainstream commerce. Kik currently claims a base of over 300 million users, a figure which includes 40 percent of American teens. Even though Kik has such a large user base, it has been difficult to monetize their digital services, and therefore innovate at a competitive level with the social media giants like Facebook and Twitter, who get much of their revenue through advertisements. The Kin token itself will ideally be used in a multitude of ways by different companies, including Kik, all aiming to create a digital interactive environment based on the currency. According to the Kin white paper, there are already foreseeable uses of the token in the Kik app. These include establishing VIP chat groups that require an entrance fee (payable in Kin) to enter, allowing premium, user-generated content to be accessed using Kin, and allowing users to highlight their messages in groups for a fee, among many others. Kik plans to sell 1 trillion Kin during its ICO event. Kik has not yet given any indication as to when this ICO will occur. Poet, short for Proof of Existence 2.0, is a shared universal ledger and platform designed to record ownership and metadata for digital creative works. Poet lets users generate an immutable ownership certificate for digital content, track and license content on the web and on the blockchain, discover new content, and verify the authenticity and authorized use of all available content. Poet is an evolution of Proof of Existence, the first use case of a blockchain that was nonfinancial in nature. Poet is a platform and a utility that will eventually enable developers to utilize the Poet catalog for new services, thus adding value to the Poet token and the network itself. The crowdsale, planned for August of 2017, has a fundraising goal of $10,000,000. The Poet team plans to release 51 percent of their 3,141,592,653 tokens to the public in their crowdsale, with the rest allocated to the Poet Foundation, angel investors, partners and founding team. Poet is akin to Mediachain, a recent Spotify acquisition. Although there is a lot of corporate interest in blockchain applications, Poet believes that open-source communities are the future of blockchain innovation. On May 31, Brave had a crowdsale for their native Basic Attention Token (BAT). This token will be used for micropayments between advertisers, publishers and users. BAT gained a lot of support before their crowdsale, evidenced by them reaching their fundraising goal of $35 million in less than 30 seconds. The hype around ICOs is real and growing. While the next big thing could be around the corner, the possibility of failure for any endeavor in the digital asset world is real. Because of this, it is important to treat these opportunities with cautious optimism. Study the different ICOs carefully before reaching a decision on whether or not to invest. Many times, knowing and understanding the team behind the project is more important than the idea they are creating itself.